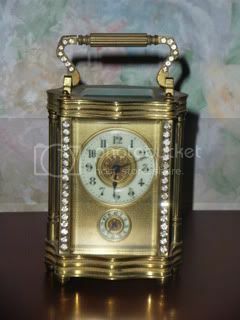 Sun clocks,water clocks, fob watches,kitchen clocks,digital clocks,wristwatches,stop watches and grandfather clocks. 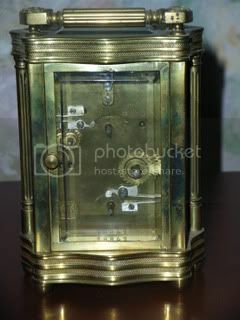 If you have a photo of a time device please feel free to post it in this thread. Edit: Original photo replaced with a newer/better photo of the same subject (with the moderators permission). 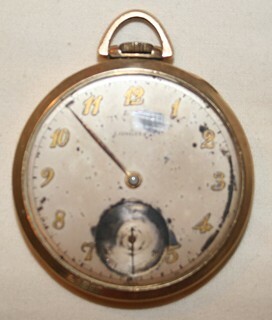 This is a photo of my Dad's Waltham Railway Watch. He was a bus driver and it kept him on time for many years. When he died my Mom passed it onto me. I let my father-in-law use it as he was a bus driver also and he used it until his death. I don't use it every day as I don't have a chain to keep it on and I don't want to lose it or drop it, but I treasure it always as a reminder of my Dad and my Father-in-law. Two men who worked hard all their lives to provide for their families and left us far too soon. If this clock could talk what a story it could tell. I had an uncle and aunt who had no children, Bill and Kit. They were a quiet retiring couple who wouldn't say boo to a goose and certainly wouldn't dream of doing anything in the slightest bit dishonest - except just once Bill gave in to temptation. Bill was in the army during WWII and was in Italy. They 'liberated' a mansion and Bill picked up this little clock to look at it. His commanding officer came into the room and said "I'll have that Young" to which my uncle replied "Sorry Sir, I saw it first, it is mine!" 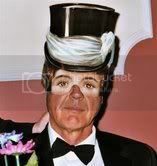 If you knew my uncle you would know that was SO out of character. Anyway, he kept it and used to take it to pieces regularly to clean it. One day I was in their home and saw him with it in pieces and asked about it, I had always liked it. He said that it was mine and I coud have it whenever I wanted. Then Bill died. Kit was always very nervous at having this piece of 'stolen property' in her home so she wrapped it up and hid it in the wardrobe. I am not quite sure who she thought was going to take action. After a couple of years she asked my mother to give it to me as Bill wanted me to have it. 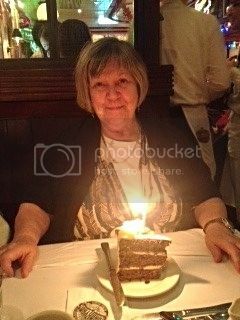 I assume numerous relatives are puzzled as to where it went, Kit had Alzheimers towards the end of her life so someone would have disposed of her property. Bill would probably turn in his grave, I never clean it - oops. 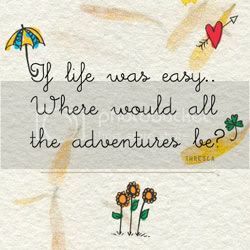 My story is not quite as dramatic as the two above this post! 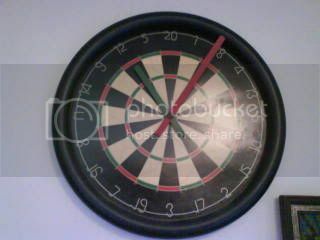 Many years ago, I used to play for a pub darts team, and actually competed in the Australian Open in 1995 and 1996 (I did not make it past the first round on either occasion). This is a birthday present from one of my teammates in that pub team. As you can see, it is now 18 past 12- or about 5 past 11- take your pick. This clock hangs in the hallway. The dial is a bit water damaged but it works perfectly but annoys the snot out of me so we don't have it going all that often. It's from the "Asonia clock company" from the very late 1800's and has become an heirloom in my partner's family. I don't think it's hugely valuable but it really suits this old house. 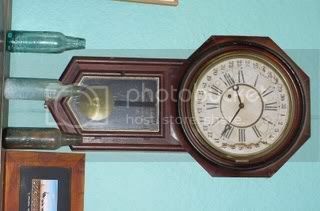 I bought this glass cased mantel clock at an auction about 15 years ago. It cost about £10, and I spent a further £15 having it repaired. 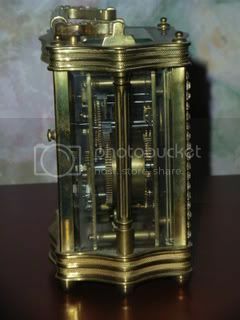 It's an 8 day clock, with a key wound movement, powered by springs and rotating weights. Oh picqero, we have/had a clock very similar to your one. Just realised when I saw your picture I have no idea where it is. I bought one just like that, but all in brass with no white bits, for my parents' silver wedding anniversary a few months before my father died in 1965. 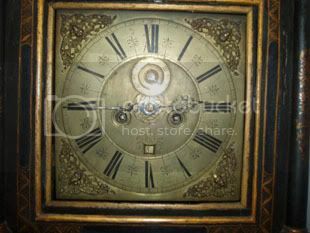 The one I bought was a 400 day clock, known as an anniversary clock as was made by Hermle. I found this forlorn pocketwatch in one of my dad's desk drawers. Why he had it, I have no idea. But now it has a home in my desk drawer. The timepieces in this photo are representative, in a way, of three different eras of my life. The stopwatch harks back to the mid-seventies, when, as a member of the Canadian Timing Association, I was privileged to be a member of the official timing team for two Canadian Grands Prix, back in the days when the F1 circus came to Mosport. We used more sophisticated watches (and later, digital timers), but I bought this one back then because I just had to have one. It wasn't just GPs, either, there was racing almost every weekend from April till September, and I went as often as I could. The wrist watch was given to me by a German friend in Spain, as she thought my habit of carrying my alarm clock in my pocket was just a bit too eccentric. hehe, clever Liz! What did people walking past think?? What did people walking past think?? Who's that crazy lady in the baseball cap? I don't have any clocks that are as pretty as the ones you all have posted above. The clocks in my picture are €2 IKEA ones. 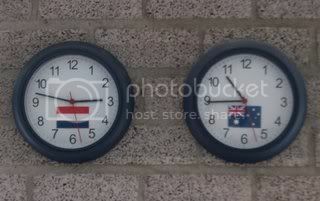 The one on the left is my (Dutch) time, the one on the right is my boyfriend's (Australian) time. The time difference should be exactly 8 hours but the "Australian" batteries are running empty. Now that one looks just like the one I bought my parents! Is it a Hermle? Well how about that! 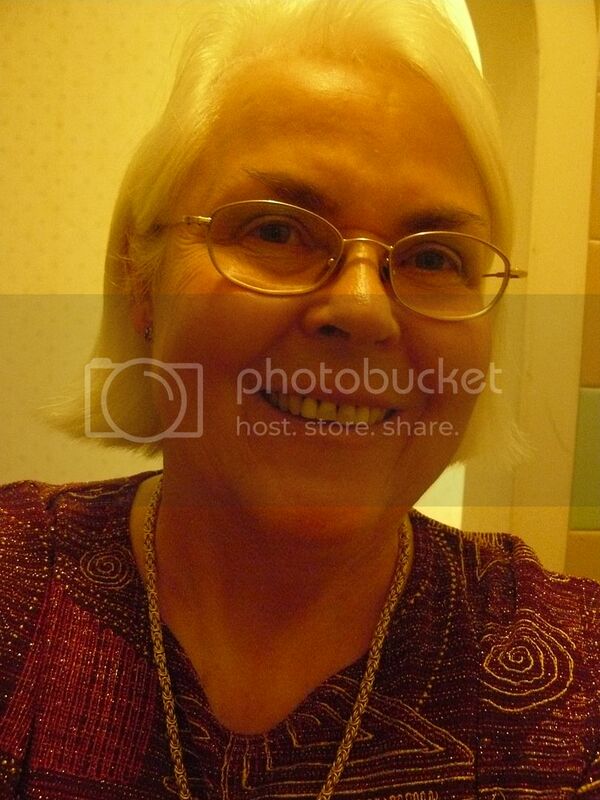 Yes it is Sue. This is the famous Railway Clock Tower in Kowloon, There was a big fuss when they pulled down the building, and the tower remains. It is swamped a bit by all the horrid hi-rises. But it's there all right. I have a sneaking suspicion that Mrs. TW doesn't read these forums! Enjoying all the time pieces and their interesting stories folks. Some of my favorite watches. I never realized that I gravitate towards the same design and color until I took this photo. 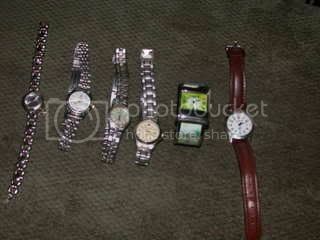 I must get some new watches! The battery has run down on a few and one of them is an actual "wind it yourself". I didn't know it was a wind-up when I bought it and took it to a jeweler to have a new battery put in. Imagine my red face when he wound it up for me. Not a good representation for a theme photo, but it's all I could think up. 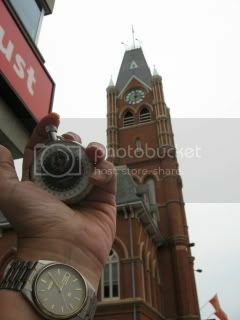 Oh I think some people have found a way of cheating - only one photo but lots of time pieces. I haven't got anything as attractive or as venerable as some of the above items. But this watch probably seems antediluvian to some youngsters - a wind-up wristwatch that I bought in the early 1970s. I'll take you back in time to the very first digital photo I took, just to see it the thing worked and I could get it onto my computer. I would have lost it when I last upgraded my hard disc, but fortunately the shop (without asking I might say) copied all the stuff from "My Documents" - I had backed up most of my stuff but not that.